An undeveloped gem in the Pacific known for its dazzling lagoon, Aitutaki is both a beach and cultural destination. A full loop around the seven square mile island (which takes a leisurely hour) provides an enlightening glimpse into the lives of South Pacific islanders. Rent a scooter and putter past piercing turquoise water, immaculately maintained lawns, coconut crab road kill (a first for me), and family graves in front yards. With no public land to speak of, people in Aitutaki bury their loved ones on their own private land. 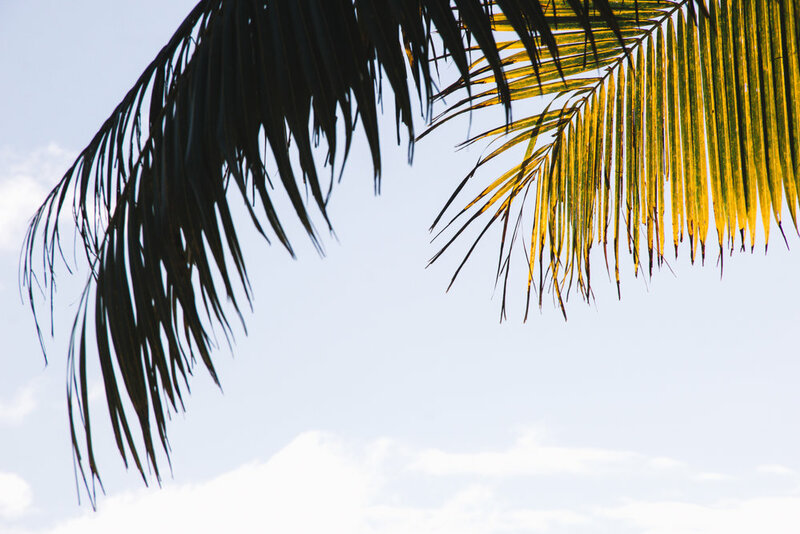 And unlike Hawaii or other Pacific islands, only Cook Islanders can purchase land here, which gives you the feeling that you're experiencing the South Pacific in a more pure form. Local women wear flowers in their hair and head garlands as genuine adornment, not as touristy kitsch. And the few resorts that the locals have allowed to put down roots here do not dominate the space. With only 125,000 visitors a year, you'll run into the same couples and groups of adventure seeking kite boarders during your stay as well as witness every local knowingly wave to each other. A visit here is a down to earth, intimate experience sweetened by the crystal clear and fish filled waters of its lagoon. The main attraction, the lagoon, is best experienced during a boating trip. 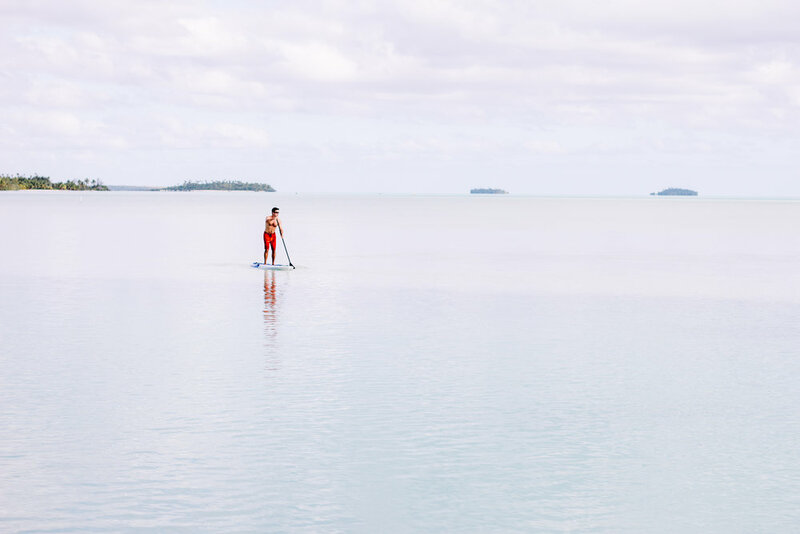 Whether you've come here for kite boarding, fishing, or simply relaxing on the beach, Aitutaki provides a unique experience in the South Pacific. ZIP AROUND THE ISLAND ON A SCOOTER | Rent a scooter at Rino's Rentals for ~$20 a day for the freedom to explore this small island at your leisure. You'll scoot around with turquoise waters less than 200 meters from the road, making for idyllic transportation. SUP, KAYAK, SNORKEL | Most resorts offer equipment for free, so take it out for a spin and enjoy that beautiful water that surrounds the space while getting a little exercise! DAY TRIP WITH BLACK PEARL CHARTERS | With fishing, snorkel, and whale watching options, Black Pearl Charters will take your vacation to the next level with a private excursion in the lagoon. While snorkeling near our lagoon hotel proved murky, snorkeling with Black Pearl Charters rated as some of the best we've ever experienced. They took us to two different spots - one for loads of fish and coral in the clearest water we've ever seen, and one with giant trevally and Māori rasse, some of the biggest fish we've ever swam with. We travelled outside the reef to look for migrating humpback whales and were not disappointed when we witnessed a playful display from a momma and calf. Tip: Book in advance and book multiple excursions. They'll take you to new places each time. WATCH THE SUNSET AND STAY UP FOR THE STARS | Enjoy a drink and the sunset (one of our favorite things to do on vacation because we always seem too busy to do it at home) and then stay out until the stars appear. The Cook Islands are in the middle of nowhere! And they don't have street lights! The Milky Way lights up the sky. RELAX AT THE SPA | Treat yourself to a massage at Tiare Spa at Pacific Resort. You are here to relax after all! We recommend booking in advance if you want to do a couple's massage or multiple treatments, but they were able to get me in for a massage when I booked in person after arrival. Pacific Resort | Hands down the best food we ate during the trip. We recommend dishes, expect they're all delicious. If you book for dinner, know that they seat guests staying at the hotel on the lower level (which offers better, unobstructed views of the sea and sunset) and visitors on the upper level. The views are still nice, but there's a noticeable difference. Koru Cafe | A local hang out for fried fish or carnitas sandwiches and Cook Islands' own lager. Pacific Resort | If you want luxury, this is the place to stay on the island. Slightly outrageous in price, but by far the most stylish, the best experience, and the tastiest food selection. Rooms starting at $1,100 USD. Etu Moana | The best mid-range hotel on the island with great customer service, clean rooms, and free WiFi (which isn't a given here). Rooms starting at $320 USD. We stayed at Aitutaki Lagoon Resort and despite decent reviews on websites, we were sorely disappointed. Their lagoon side restaurant as well as three beach side bungalows burned down in July, and so meals are without a view and some guests had to be moved around to accommodate less villas. 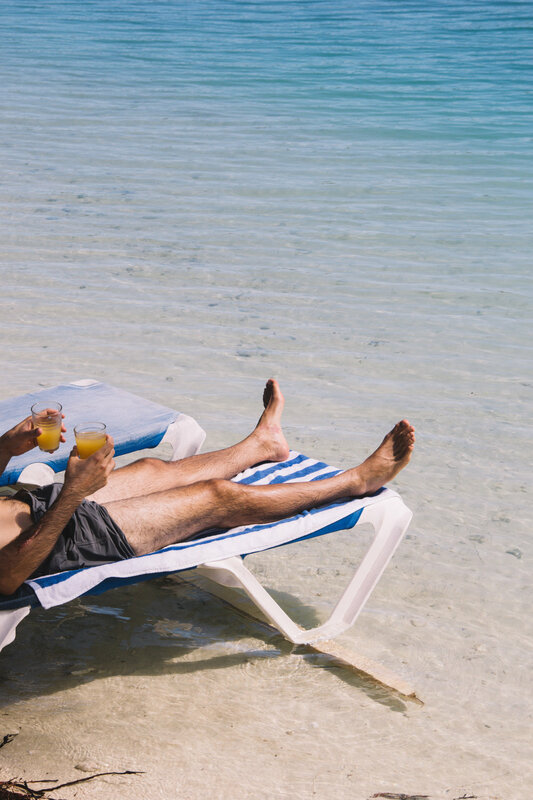 The food and drinks were similarly priced to other resorts, although we were not impressed with the overall selection or quality and despite being on the lagoon, the water is much clearer on the "snorkel" side of the island where all other resorts are located. For the price, we were disappointed in the value, level of service, and experience. Bounty Colada, Pacific Resort | Served in a coconut with the addition of melon flavors. Hands down our favorite drink of the trip. Classic Piña Colada, Aitutaki Lagoon Resort | Served strong, just the way we like it. Classic Piña Colada, Pacific Resort | Not as flashy as the Bounty Colada as its served in a plastic cup, but delicious none the less. Classic Piña Colada, Tamanu Beach Resort | Neither flashy nor strong. Note: the piña coladas here are made with fresh coconut flesh and milk, which is what makes them so great, but it also means they're not as "frozen" as what you'd get in the US. We heard a number of people complain about this. For us, we loved them as served, but just a heads up if you like your piñas served ice cold with crushed ice in every sip.